It is simple to achieve a designer effect with concrete flooring due to the huge variety of tones and styles it comes in. 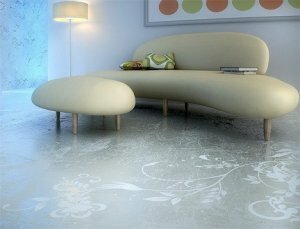 To create polished concrete, a special process is used that creates an amazingly shiny surface. Another option is epoxy coatings that make concrete shine as much as polished ceramic but without the risks of chipping and cracking. Because of its status as a natural insulation, concrete is also a wise choice in terms of energy savings. Polished concrete can also be made to appear similar to other types of flooring materials, including marble or wood. During the winter months, light from outside easily warms concrete flooring, and in the summertime, concrete floors stay comfortably cool. Another advantage that many homeowners enjoy about concrete flooring is that it responds well to creative twists. Since it can be made to emulate other flooring materials and can be designed to possess a wide variety of color tones, it is easy to express one's artistic side with concrete floors. No matter what type of look you want to achieve, concrete flooring makes it easy if you're willing to do the work. It is possible to produce a more traditional look or one that is more contemporary, by insetting objects such as mementos or jewelry during the floor's construction. By doing so, you can own a truly special and personal floor that warms your heart each time you walk on it. Because polished concrete floors require professional installation, construction costs must be figured into your flooring budget. It is important to remember, however, that unlike many other types of flooring, polished concrete floors will stay in great condition for as long as your home exists. 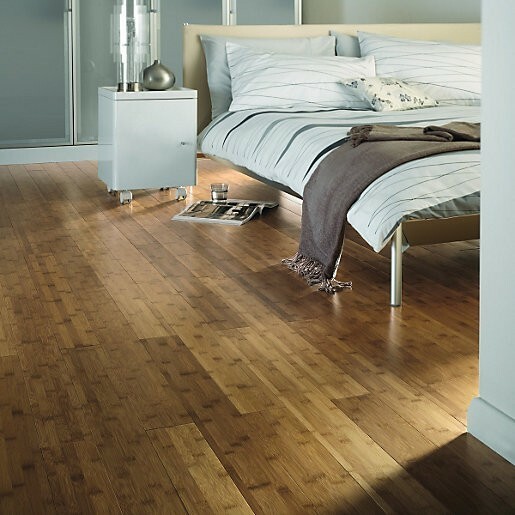 Bamboo, a plentiful reed that grows quickly, is quickly becoming very popular in the flooring market because of its friendliness to the environment. Bamboo is available in a wide variety of colors that range from rich tan to light, off-white tones, making it easy to find a tone that perfectly matches the rest of your home. According to the Janka scale of hardness, bamboo is harder than both red oak and maple. Sturdy and dependable, bamboo is an excellent option for areas that take a beating due to high foot traffic or children. Because bamboo is laminated, it is invulnerable to cupping, gapping, curling or warping. Since bamboo hails from high-humidity tropical environments, it features excellent resilience to moist conditions. This makes it perfect for bathroom or kitchen floors. Bamboo flooring is easy for homeowners to install themselves if they choose to. Depending on the individual bamboo product, installation consists of stapling, gluing or nailing the flooring down. Floating bamboo floors are also an option and are the easiest to install. Both polished concrete and bamboo flooring represent durable and stylish options that will hold up well under constant use in any home. For a distinct look that maintains its shine for a long time, either bamboo or concrete is an excellent choice. Polished concrete gives homeowners greater creative leeway, but it has a cooler appearance than bamboo. Natural bamboo flooring offers more choices when it comes to patterning. Another benefit of bamboo flooring is that many homeowners can install it themselves, but the installation of polished concrete floors usually requires the skills of an experienced professional. In the end, the choice of using either bamboo or concrete flooring is up to the individual. Both options are in style and offer numerous practical advantages, as well. By understanding the similarities and differences between bamboo and concrete flooring, you can make the best choice for your own home and family. These look simply stunning and I will bear them in mind for my next flooring project. Previously I laid a white laminate wood effect floor to great effect and am still very happy with the result. Its not as cold as we thought it might be in winter but hard to keep clean - but at least you know it IS clean. Must be the same with these gorgeous floors. Now what I want to know is in the top image is that a projection ? or something in the floor ? Great evolution - a good floor really starts a room off. But you must be into white and hard design to like and I'm guessing that a spill of liquid would make for an ice rink ! The same for any floor in fact. Polish spraying around laminate flooring should be done carefully as it makes for a slippery surface that takes a time to go away.